This is a creature said to exist in the Gobi desert. It is so feared tha tthe nomadic tribes swear of its existence, even if they have never seen it, but when they speak of it, they speak of it with intense fear. The Mongolian Death worm, or olgoi-khorkhoi (means "large intestine"), is a cryptid that is described as a three to five feet long and wide. Its name is based on its physical appearance and is said to be blood red in color. Sometimes with spots or horns on both ends, the Death worm is also given bizarre preternatural abilities, such as the ability to secrete or expel a yellow corrosive saliva and capable of projecting electrical blasts from a distance. Its habits are described as usually hibernating for most of the year and is active during the months of June and July. Like regular worms, it does appear during the rain and when the ground is wet. 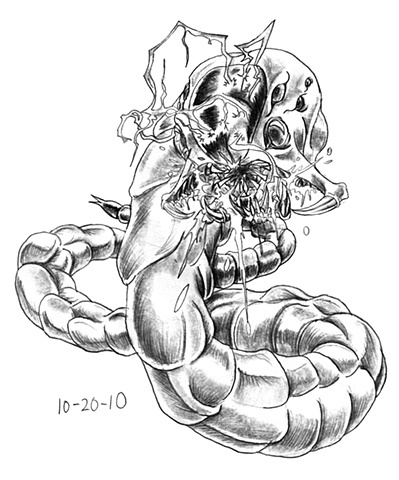 For my depiction, the death worm is drawn to look like the intestine its based on, plus giving it its vicious maw of many teeth as the acidic slime flows out of its mouth. I mad the ridge on its forehead be the conductor to its ability to project electrical blasts as the current flows over it. Definitely had a predator vibe with the head, save for the multiple eyes, that's just for fun.